oday at Sydney's Museum of Contemporary Art I saw the most magnificent piece of artwork brought in for Biennale. I will admit that at first glance I thought it was just another massive installation with a bunch of things thrown together (you know, some kinds of modern art...) but I had a closer look when the lights hit the bottles and I caught a flash of silver. I recoiled in horror at what I thought was looking at: A massive sea of bottles with pieces of preserved fish/eels. Now I must explain. I am mortified of fish. I mean, I enjoy drawing their beautiful streamlined figures and am immensely intrigued by the way they exist in a completely different medium, but they scare me when they are in two particular stages of life: Near-death and um, dead. Does that make sense? I am terrified when I see them flipping and writhing for air after they have brilliantly jumped out of their tank, or have been tricked into swallowing a hook and are gasping on the jetty. The desperateness makes me uncomfortable. The awkward, off-beat, rhythmic thumping of fish-body against the floorboards makes my veins run ice. I'm not quite sure how other people can stand to watch a fish out of water without at least getting goosebumps. And when their tiny gills slowly give up and their sides begin to stop heaving- it's even worse. Now it's a cold dead fish. Silver scales were lurking in these dark bottles and I couldn't believe it. I suppressed my gasp and immediately looked for the artist description for the piece, although at that point I was a hundred percent sure that there were pieces of butchered fish in the room. To my relief and when I finally allowed commonsense back into my head, it was revealed that the fish scales were drawn inside the bottle using a old traditional chinese painting technique (bent brushes) and there were no creatures harmed in the making of the art piece. Simply jaw-droppingly amazing work. Mind, blown. In China, the word independence has a special meaning. Independent thinking and individual behaviour have a potentially confronting meaning when living in a collective society and absolute politically centred nation. I regard Chinese society as an arena for my art to experiment within. Any subject – domestic, political, cultural, historic – is a topic for me to use and be inspired by. 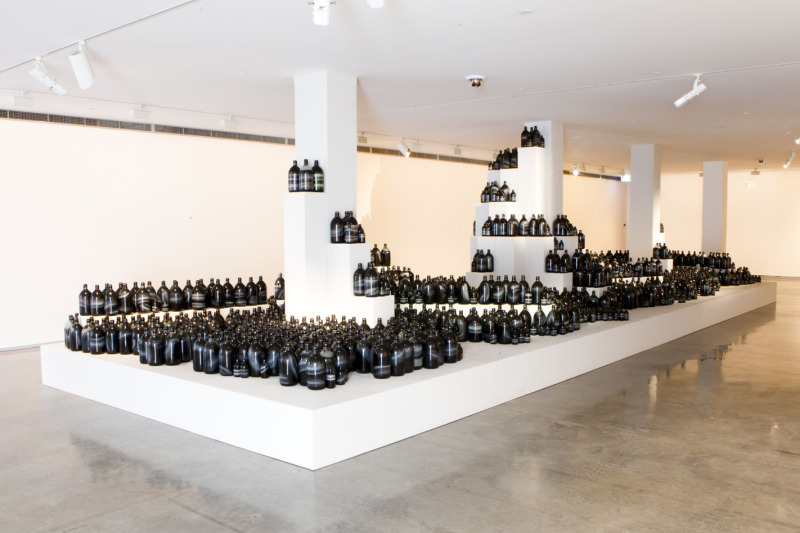 My recent body of work – the bottle painting series – reveals the developing phenomenon of current China. I liken it to a human body and strategic surgical medical practice. My aim is to use a traditional technique but, while doing so, reveal and strip away issues of personal, social and cultural importance.